Our customer came to us due to frustration with our competitor’s undependable delivery. The parts require a 90 degree bend on each end, with careful attention to orientation. The ends are then flattened and drilled. 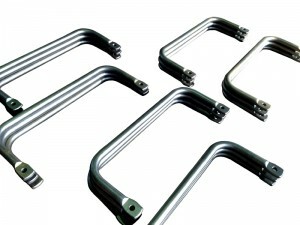 Each part is then heat treated to provide uniform performance as an aftermarket RV torsion bar. Product Description – Round Bars are hot bent to 90 Deg, ends are flattened and holes drilled.